Linux is an operating system based on UNIX, and was first introduced by Linus Torvalds. It is based on the Linux Kernel, and can run on different hardware platforms manufactured by Intel, MIPS, HP, IBM, SPARC and Motorola. Another popular element in Linux is its mascot, a penguin figure named Tux. Unix originally began as a propriety operating system from Bell Laboratories, which later on spawned into different commercial versions. On the other hand, Linux is free, open source and intended as a non-propriety operating system for the masses. BASH is short for Bourne Again SHell. It was written by Steve Bourne as a replacement to the original Bourne Shell (represented by /bin/sh). It combines all the features from the original version of Bourne Shell, plus additional functions to make it easier and more convenient to use. It has since been adapted as the default shell for most systems running Linux. The Linux Kernel is a low-level systems software whose main role is to manage hardware resources for the user. It is also used to provide an interface for user-level interaction. What the command used for Search file or files for specific text? grep command used for files for specific text. How does DNS resolution work? A client application requests an IP address from the name server usually by connecting to UDP port 53. The name server will attempt to resolve the FQDN based on its resolver library, which may contain authoritative information about the host requested or cached data about that name from an earlier query. If the name server does not already have the answer, it will turn to root name servers to determine the authoritative for the FQDN in question. Then, with that information, it will query the authoritative name servers for that name to determine the IP address. BIOS reads the MBR where Boot Loader sits, Boot Loader reads Kernel into memory, Kernel starts Init process, Init reads inittab, executes rc.sysinit, the rc script than starts services to reach the default run level and once this is done the last thing that gets run is the rc.local script. All files have its description stored in a structure called ‘inode’. The inode contains info about the file-size, access and modification time, permission and so on. In addition to descriptions about the file, the inode contains pointers to the data blocks of the file. What does /etc/skell directory contains? The /etc/skel directory contains files and directories that are automatically copied over to a new user's home directory when such user is created by the useradd or adduser command. What is a swap space? A swap space is a certain amount of space used by Linux to temporarily hold some programs that are running concurrently. This happens when RAM does not have enough memory to hold all programs that are executing. 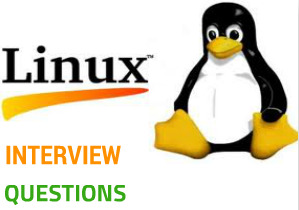 What are the basic components of Linux? Just like any other typical operating system, Linux has all of these components: kernel, shells and GUIs, system utilities, and application program. What makes Linux advantageous over other operating system is that every aspect comes with additional features and all codes for these are downloadable for free. What are The steps to remove the swap file? Firstly disable the swap file by “swapoff” command. Remove Swap file entry from /etc/fstab file. Now remove the swap file by “rm” command. How we will check free space on drive /dev/sda with parted command? Running : The process is either running or it is ready to run . Waiting : The process is waiting for an event or for a resource. Stopped : The process has been stopped, usually by receiving a signal. What can you type at a command line to determine which shell you are using? What are filenames that are preceded by a dot? In general, filenames that are preceded by a dot are hidden files. These files can be configuration files that hold important data or setup info. Setting these files as hidden makes it less likely to be accidentally deleted. This serves as an alternative to minimizing and maximizing different windows on the current desktop. Using virtual desktops, each desktop is a clean slate where you can open one or more programs. Rather than minimizing/restoring all those programs as needed, you can simply shuffle between virtual desktops with programs intact in each one. What does a nameless (empty) directory represent? This empty directory name serves as the nameless base of the Linux file system. This serves as an attachment for all other directories, files, drives and devices. What is the pwd command? The pwd command is short for print working directory command. It’s counterpart in DOS is the cd command, and is used to display the current location in the directory tree. What are the kinds of permissions under Linux? Redirection is the process of directing data from one output to another. It can also be used to direct an output as an input to another process. What are the contents in /usr/local? It contains locally installed files. This directory actually matters in environments where files are stored on the network. Specifically, locally-installed files go to /usr/local/bin, /usr/local/lib, etc.). Another application of this directory is that it is used for software packages installed from source, or software not officially shipped with the distribution. How do you insert comments in the command line prompt?